Leslie Jimenez talks with injured and sick people, firefighters, cops, drunks, EMTs, bystanders, perpetrators, and the suicidal. When she’s done, her sister Chelsea Stiner takes over. Amy and Rachel Heser can relate—they’re the other set of dispatching sisters for Great Falls Cascade County 911. Between calls to and from Great Falls police, Cascade County Sheriff’s office, Great Falls Fire Rescue, ambulance crews, and Cascade County’s rural fire departments, these four young women have heard it all. Chelsea Stiner has been on the job for twelve years. Rachel Heser was hired a decade ago. Amy soon followed Rachel. Leslie is the relative newcomer, with two years at the consolidated dispatch facility up on Airport Hill. All four love the job, which is trying at times, but very rewarding. “Things are hopping from the get-go,” Stiner says. Full moons? 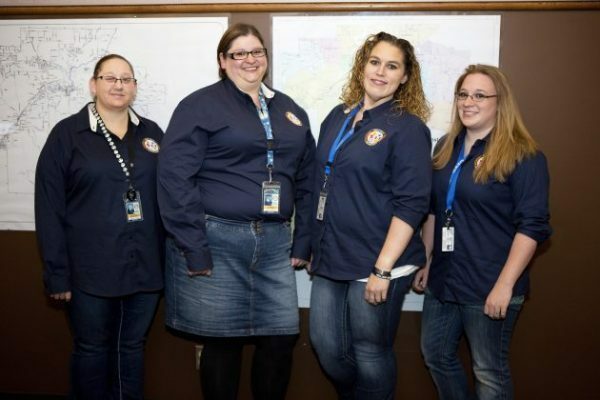 All four dispatching sisters agree: they’re no joke. Though both sets of sisters have close families, the law enforcement community is there for them. When Leslie and Chelsea’s brother was killed in a car accident last year, area badges turned out in force.